Mohsen Mostafavi, Gareth Doherty. Ecological Urbanism. Harvard University Graduate School of Design, 2010. Print. 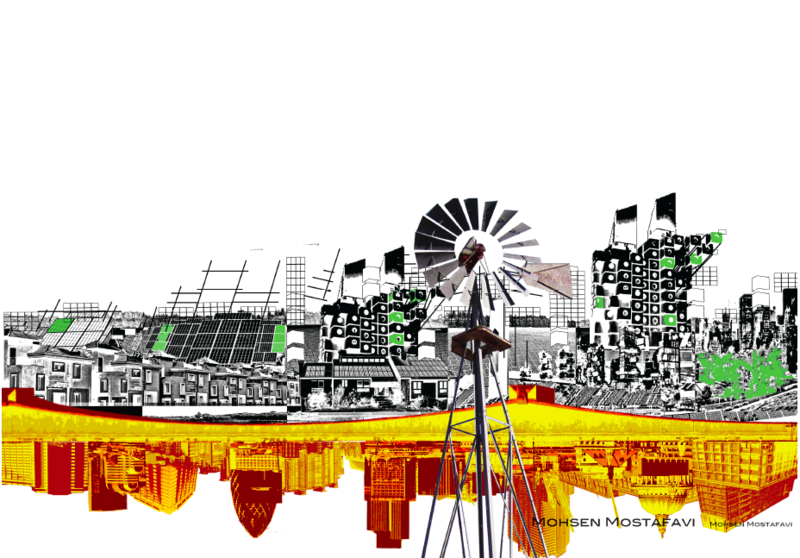 Mohsen Mostafavi, the dean of GSD, defined this new idea as a new sensibility and framework to incorporate and accommodate the inherent conflictual conditions between ecology and urbanism through interdisciplinary knowledge, methods and clues to improve urban life. This does not come out from nowhere, dating back to the early part of last century, Patrick Geddess already hinted that urbanism should respond to and transform other criteria that affect and shape cities such as geography orientation, weather pollution, sound and smell. The environment ecology basically associates human existence within the new historical context, the ‘ Territory of Existence’. It aims to develop a new discipline and ethic aesthetic paradigm, to deal with our surroundings. This is considered to be a ‘Reformulation of Subject’, which there is an ethical pursuit about decoding social and political constraints on subjective bodies. Caiza Forum in Madrid by Herzog De Meuron is a perfect example in preserving the essence of the past and adding in new elements, which form an interesting place for modern social encounter. The social ecology, on the other hand concerns with individual responsibilities and group actions (human relations) and bring them back to the context. In a bigger scale, this means to relate the environment with political social and cultural situations and ‘reshape objectives of production of both the material and immaterial assets.’ which referred by Guattari as the ‘Components of Subjectification’. Last but not least, the mental ecology or the human subjectivity, which citizens should be able to regenerate themselves as liberated individuals and should think wildly. A good example is the making of a film called Grow Your Own, refugees who lost their homes and identities, when confined in a catering room, clammed up to the psychotherapist, Margrit Ruegg. Yet when they are allocated plots of land, and work on them for a period of time, they regain confidence and establish communication, mutual trust, then they are willing to open up themselves again. This shows how a good regional planning and strategy can change individuals thus affect the order of a society and its productivity. First, it should be able to provide a set of sensibilities and practices that enhance urban development, establish a cross-disciplinary and collaborative approach such that urbanism could be developed through ecology; and existing urban conditions could be retrofitted and be utilized for future planning. Henri Lefebvre refers this as ‘Transduction’ An example for this is the Promenade Plantee in Paris, unlike normal Parisian Boulevards, it consists of landscape with an ever-changing sectional relationship to its vast surrounding, by juxtaposition and contrasts, it is a memory device for creating a new relationship between the ground, the human intervention and the temporal experience of the viewers on it. 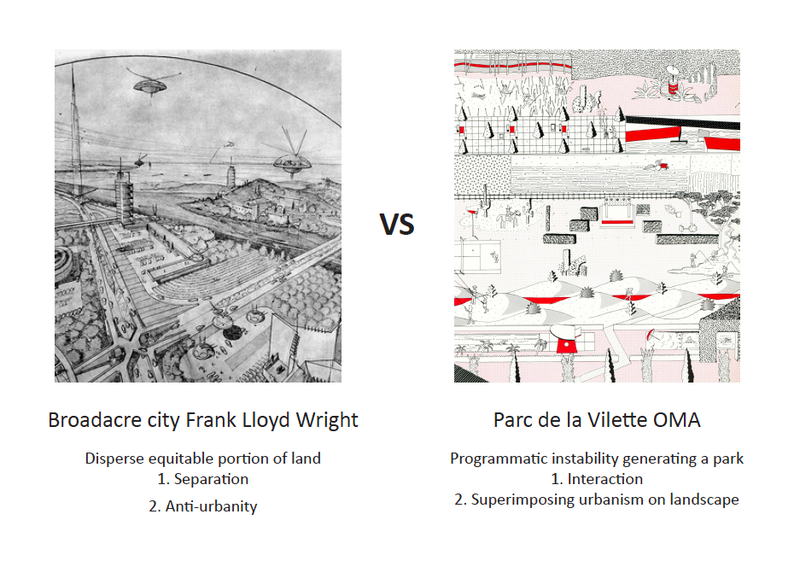 Two other comparable examples are the Parc de La Villette by OMA and Broadacre City by Frank Lloyad Wright. The former one try to combine programmatic instability with architectural specificity, which eventually generate an urban landscape, this is an ecological urbanism about interactions and superimposition through an artificial landscape. While the latter one is all about separation and anti-urbanity through equal and disperse distribution of land to individuals. 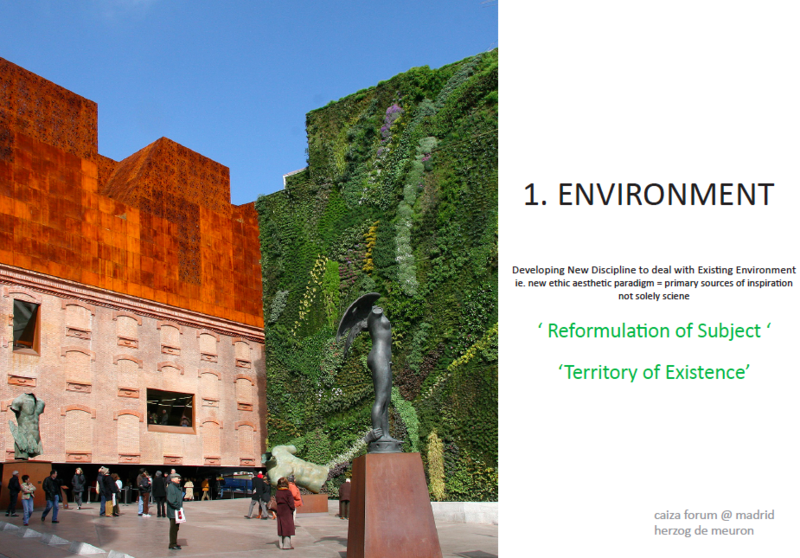 From these three examples, you can see how diverse the end result of ecological urbanism could be, driven by personal subjective bias and preference. Secondly, a multi-scalar design strategy should be established which means the scope of design should cover both small architecture and large urban planning. 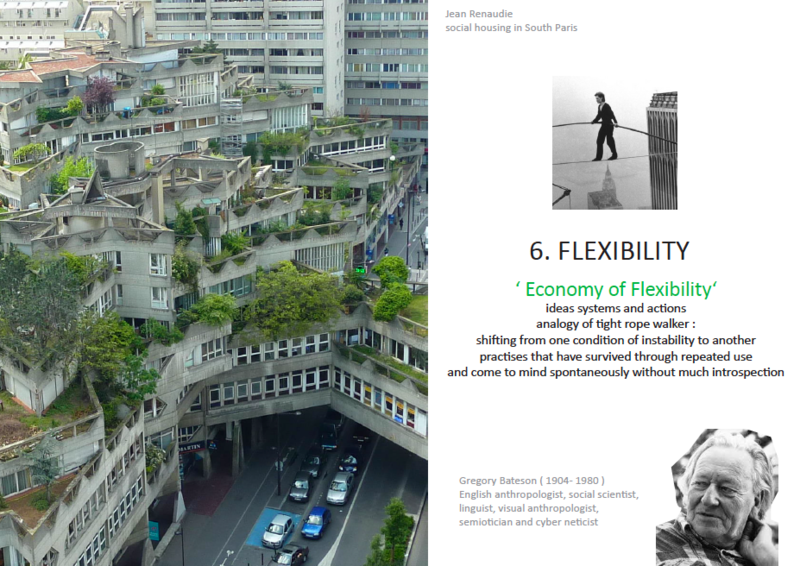 The adaptive urbanism suggested by Andrea Branzi points out that the design should be reversibly evolving and provisory, it should be able to respond to changing needs of society. This is visualized in New Orleans regional planning where lefts over areas are intertwined with space of leisure, residential areas and working spaces. Another important quality of ecological urbanism is connectivity which differs a city from ‘isolated camps’ whose inhabitants are ‘imprisoned’.. Mohsen first started with listing the negative impacts of an automobile-based city, complaining about the general lack of investment in public regional infrastructure in the states comparing to that in European countries. He thinks that density is an essential element for a modern city. However, his latter quote of Los Angeles: The architecture of Four ecologies by Reyner Banham, who considers LA, a horizontally expanded metropolis as a place of impermanence, mobility and fantasy. And he also mentioned the Greater Paris vision by French President Nicolas Sarkozy who suggested merging the city centre with suburbs with an automated rail system. This shows that indeed, how a city is layout does not really matter, either it’s a vertically expanding skyscraper city or an urban sprawl city; either people move around by private driving or public transportation, as long as it works with a certain degree of connectivity which allows social mobility, it is considered to be sustainable. In the world of ecological urbanism, new and unconventional ways that are not simply a copy of past successful examples are preferred. Imagination is an important element for this. Instead of implementing laws to control waste production and energy consumption, why not just dump a huge pile of garbage in the middle of the city centre to remind people of their excessive exploitation of natural resources and destruction of the nature? If we do not confront ourselves and deal with reality both literally and metaphorically, current problems will not be solved fundamentally. Therefore, solutions for ecological urbanism should not be bounded by architecture or urban planning ; it could be of any form in any fields you could think of as long as they have influence in shaping the city. According to AbdouMaliqSimone, ‘’ while it is clear that the pursuit of structured plans, development agendas and rational decision making require economic supports and political will often lacking in impoverished societies, the apparent provisionally of African urban life also masks the degree could be found in the Detroit urban farming and farmers market in Havana Cuba. This stress on locality is echoed by the extraterritorial urbanism mentioned by Mohsen. It is about a bottom-up urbanism, which is exempted from conventional legal and regulatory framework to produce ingenious and creative solutions to improve urban life. On the other hand, Gregory Bateson, suggested the economy of flexibility, which focuses on ideas systems and actions. 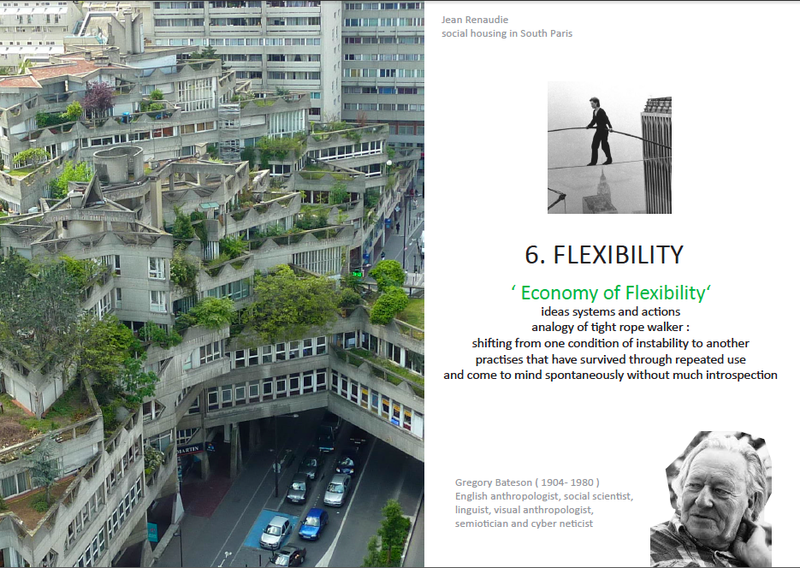 By the analogy of a tight rope walker, this flexibility means an adaptive shift from one condition of instability to another, such that this ability become a reflex through repeated use which could be visualized in the social housing project in South Paris by Jean Renaudie in 1960s. This complex is considered as a ‘visionary departure’ of the modernist idea of minimal existence. It creates a new lifestyle by the flexibility and diversity of indoor-outdoor relationships through a design of a complicated geometric pattern. This flexibility is somehow interrelated with the last quality Mohsen covered – openness for disagreement. 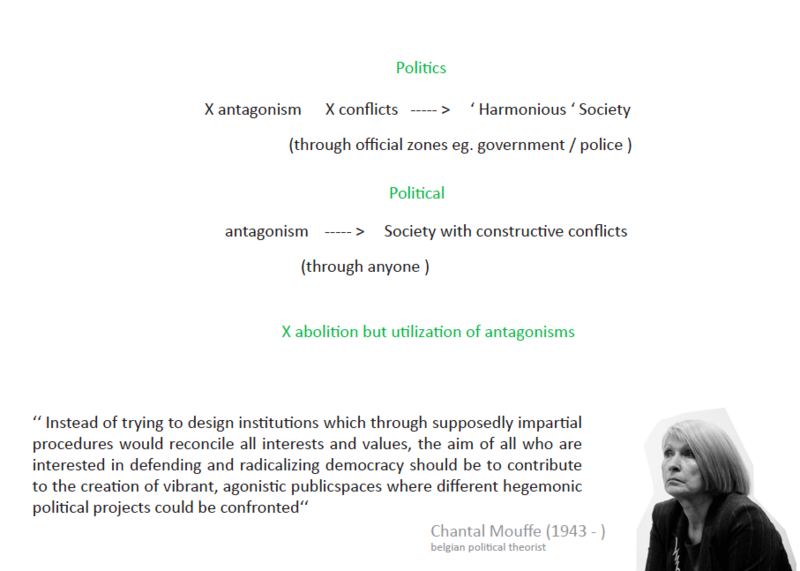 Chantal Mouffe clarified the difference between political and politics when it comes to the issue of conflicting relations. She refers political as a dimension of antagonism, which constitute to human societies while politics is a set of rigid practices or institutions, which order is created and people need to live within that framework. ‘’ Instead of trying to design institutions which through supposedly impartial procedures would reconcile all interests and values, the aim of all who are interested in defending and radicalizing democracy should be to contribute to the creation of vibrant, agonistic public spaces where different hegemonic political projects could be confronted.’’ Mouffe said. This means that instead of avoiding conflicts, we should indeed utilize the energy and new points of departure from disagreements constructively to create a more diverse and adaptable society. 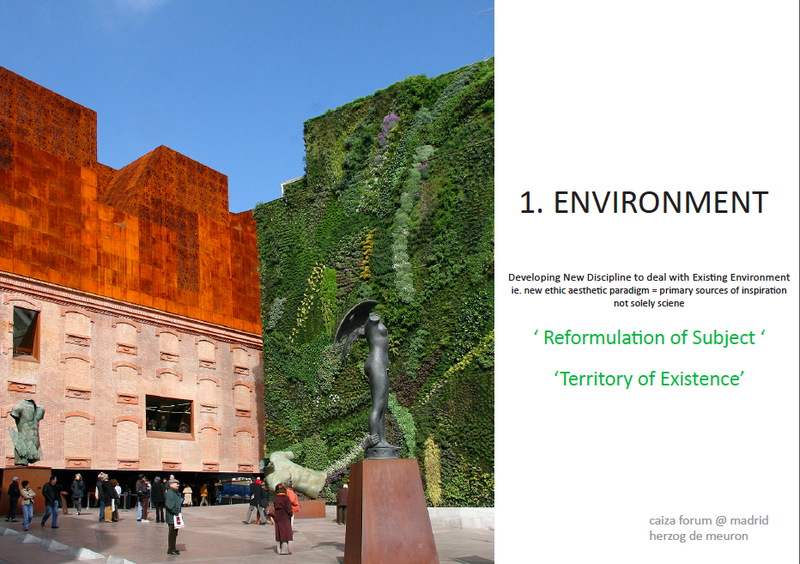 Though there are a few criticisms about ecological urbanism, like the high cost of executing, ambiguity in its definitions etc… With the above framewor, hopefully, we would be able to engender greater opportunities for social and spatial democracy, politically and ethically and aesthetically, through unpredictable methods and cooperation among different fields, and eventually move towards a more pleasurable future.